David Janzen on the left with Alden Bass and Sally Youngquist. The Nurturing Communities Project was born in 2009 out of a conversation between David Janzen of the Reba Place Fellowship and Jonathan Wilson-Hartgrove of Rutba House at the Ekklesia Project Conference. As the director of the School for Conversion, Jonathan saw a need for an experienced, pastoral figure to visit younger communities, encouraging them and advising them when necessary. David Janzen’s many years living in and leading communities made him an ideal candidate for the task. David and others began traveling the country, visiting new communities and strengthening ties with older ones. Several of these groups got together in 2010 before the annual Christian Community Development Association (CCDA) Conference, and from this original gathering a tradition of annual meetings has developed. 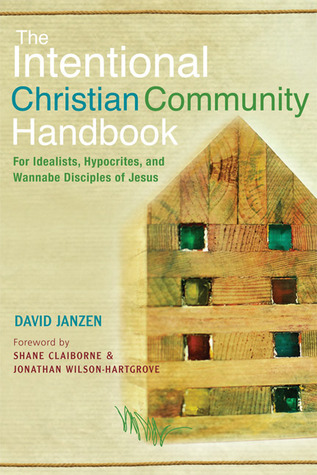 Another product of David’s work was The Christian Intentional Community Handbook: For Idealists, Hypocrites and Wannabe Disciples of Jesus (2012), a book which has provided guidance for many young communities. To purchase book, click on picture above. Since 2013, there has been alternating meetings for NCP leaders and once every two years, a "Ya'll come" gathering for communities nationwide to gather and meet together. These gatherings have been in various settings across the country. Following the 2017 national gathering, the leadership team decided to change the name to Nurturing Communities Network. David Janzen is passing the torch of Nurturing Communities Network to new leadership as of this fall. Details of this will be included as the leadership is formalized. Here are some photos from over the years as well as David Janzen's Reports on the time together. Please CLICK on the photos below to read reports on the gatherings. 2013: "Ya'll Come" Gathering at Platte Clove Bruderhof Community in upstate New York. 2016: One of the smaller community leadership gatherings held in Wisconsin. 2017: "Ya'll Come" National Gathering held at Bruderhof in Pennsylvania.